Internet ad spending in the U.S. grew 15% last year to $36.6 billion. That growth rate marks a slowdown from the 22% gain in 2011 and is more in line with the 14.5% rise in 2010. For the fourth quarter of 2012, online ad spending reached $10.3 billion -- up 14.9% from $9 billion a year ago, and 11.6% from $9.2 million in the third quarter, according to annual data released by the Interactive Advertising Bureau and PricewaterhouseCoopers on Tuesday. For the second straight year, mobile advertising was the fastest-growing ad category, up 111% to $3.4 billion. Its share of digital ad dollars also increased to 9.2% from 5% a year ago, making it a larger segment than more established categories like classifieds, lead generation and online video ads. While still a small portion, video at 6.4% also saw strong gains, rising 29% (the same rate as last year) to $2.3 billion. That, however, could not offset a decline in the overall growth rate for online display advertising in 2012 to 9% from 15% a year ago. 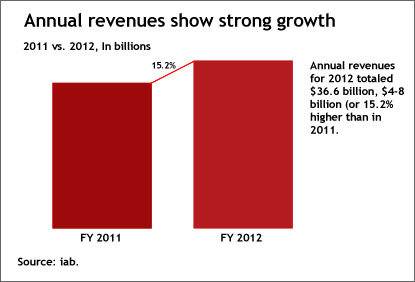 The display total of $12 billion accounted for a third of digital ad spending, down from about 35% in 2011. Search advertising accounted for $16.9 billion, or 46% of total spending, That total represents a gain of 14.5% from $14.8 billion in 2011, but a growth rate well below the prior year’s 27% spike in search ad dollars. Classifieds, lead generation and email continued to see their share of ad budgets contract, at 6.6%, 4.6%, and 0.4% each. The split between performance-based and CPM-based advertising was roughly on par with last year, with the former taking two-thirds of spending, or $24 billion, compared to a 32%, or $11.7 billion, for the latter. The share allocated to hybrid ads shrank from 4.2% to 2.1%, or $768 million, with that model clearly losing favor in 2012. Among industry categories, retail remained largest category for online ad spending, accounting for 20% in 2012, followed by financial services (13%), auto (12%), telecom (11%), and computing products (9%). Each of the top ad verticals was within a percentage point or two of their share in 2011. The $36.6 billion in total digital ad spending vaults the Internet ahead of cable TV ($32.5 billion), closing in on broadcast TV ($39.6 billion) as the top ad-supported medium overall, according to IAB estimates. eMarketer has projected U.S. digital ad spending will reach $42.5 billion this year.